As an Allrecipes.com Allstar I have some activities to work through each month to fulfill my commitment. One of the activities this month was to make, review, and photograph something that tastes like summer. 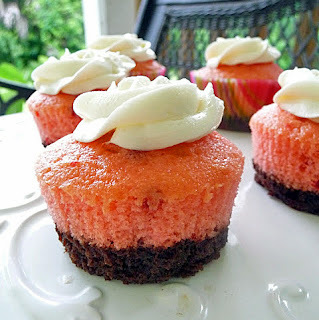 I chose these Neapolitan Cupcakes because ice cream is a real summer treat and these just sounded really good. Also, this particular recipe needed a photograph so I thought it was a good choice! It was a good choice alright! These were easy to make, and Don said they really do taste like Neapolitan Ice Cream! I didn't believe him - I thought he was just trying to be the sweet hubs he is. So I had to try one for myself. I ended up trying to be good and only ate 1/2 of one and you know what? He wasn't just being sweet (I should have known better haha)! They really DO taste like Neapolitan Ice Cream! Very cool! They turned out so pretty too! ...off to eat that other half!! Preheat oven to 325 degrees F and line a muffin tin with cupcake liners (about 24). Combine brownie mix with 1/2 cup vegetable oil, 2 eggs, and 1/4 cup water. Mix until combined. Set aside. In a separate bowl, combine strawberry cake mix with 1 cup water, 3 eggs, and 1/3 cup vegetable oil. Beat on low for about 30 seconds and then on medium for about 2 minutes. Fill 1/3 of each of the cupcake liners with brownie mix. Top the brownie mix with strawberry cake mix so the cupcake liners are 2/3 full. You will have cake mix leftover. I like to freeze it to make another batch later. It freezes well. Bake in the preheated oven for about 18-20 minutes or until the cupcake tops spring back when lightly pressed. Cool in pan on a wire rack for 10 minutes and then remove from pan and cool completely on wire rack. Beat 3/4 cup softened butter until creamy. Add 1 cup confectioner's sugar and beat until combined. Turn mixer speed to high and beat until fluffy. Keep adding confectioner's sugar until desired taste and consistency is achieved. Add 1/2 teaspoon vanilla and beat until combined. Pipe icing onto cooled cupcakes and enjoy! Yeah this rainy days indoor stuff is just not so goofd for the hips! These do sound really good! Love how its brownie on the bottom!